The False Siamese Tiger Fish (Datnioides microlepis) is also known to tropical fish keeping enthusiasts as the Indonesian Tigerfish, Indonesian Tiger Perch, Fine Scaled Tigerfish, Siamese Tiger Fish, Indo Datnoidand, and Sumatran Tigerfish. 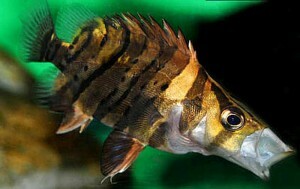 It is a beautiful freshwater species that is found in SouthEast Asia, Borneo, and Sumatra. The False Siamese Tiger Fish is one of five species of Indo-Pacific Tigerperches, of which only three inhabit fresh water. False Siamese Tiger Fish have a deeper body than those of the other Datnioides species and finer scales in comparison to Datnioides quadrafasciatus and Datnioides campbelli; hence the more common name Fine Scaled Tigerfish. They are frequently misidentified as Siamese Tigerfish however, the true Siamese Tigerfish (Datnioides pulcher) have only 3 to 4 black vertical stripes on it’s flanks vs. the 5 to 7 vertical stripes displayed on Datnioides microlepis. Both species have protrusile mouths to take large prey and both are unable to be visually sexed. Although False Siamese Tiger Fish are sometimes described as being a brackish water species; they are a true freshwater fish that does best in clean alkaline water conditions. This species needs exceptionally good water quality in their aquarium to thrive, and when not kept alone as a single show specimen, needs to be housed with at least 5 or more of their own kind in at least a 100 gallon or larger aquarium. Smaller groups can result in aggression between individuals. False Siamese Tiger Fish are relatively shy and require plenty of places in the aquarium for them to hide. They do best in a densely planted tank with tall plants, lots of driftwood and driftwood roots, a sandy or fine gravel substrate, some rock structure and plenty of free swimming space. Although Datnioides microlepis grow to over 18″ in the wild, they are slow growing in an aquarium environment and are not likely to reach their maximum size. 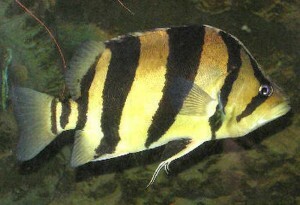 False Siamese Tiger Fish (Datnioides microlepis) appear to be more rambunctious in an aquarium environment than Datnioides pulcher, and are probably more aggressive towards other tigerfish species when kept in close confinement. Choose their tank mates wisely. They should not be kept with other aggressive species or with smaller fish they could consider a meal. The False Siamese Tiger Fish has not been successfully bred in an aquarium environment and to date, very little is known about their breeding habits. 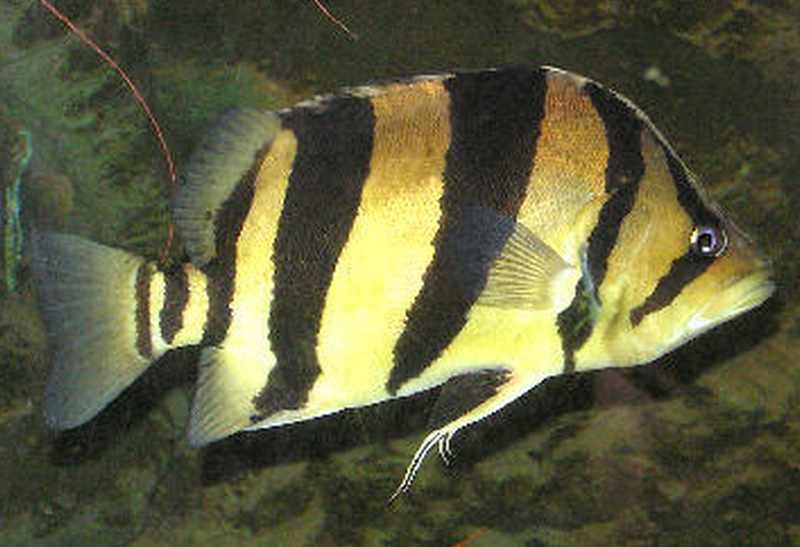 All Tiger Fish are carnivorous and will usually not immediately accept anything but live foods. They can be taught to accept floating carnivore pellets but do better with meaty foods like ghost shrimp, prawns, silversides or fresh beef heart. They also do better when fed small portions a couple of times a day rather than a single large portion. Of course live feeder fish are always eagerly accepted. The False Siamese Tiger Fish is rare in the tropical fish keeping arena and command a high price when available at any size.